Somewhere deep in the Taelgarian lands of Tamara, there once was a barren, lifeless desert. 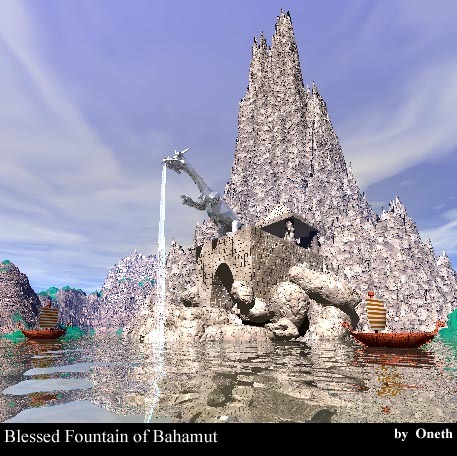 But then Bahamut blessed the land with His holy fountain, and the dry valley became a lake, and greenery soon grew on the mountainsides. People from far and wide make a pilgrimage to see the magnificent fountain that never dries out, and to taste the healing waters. This is a Bryce scene, of course. I built the temple out of a box carved with a cylinder for the entry arch, and a pyramid on some columns. Then I made it look carved out of the mountain by sticking it in a bunch of rocks and making the stone the same. It's that pitted concrete stuff. The barges I swiped from Ray Dream Models!